''While celebrities and politicians are often under the media’s microscope, their wealth and privilege allows them to carry many of their darkest secrets to the grave. Those in power have one goal: maintaining a squeaky clean image – whatever it takes. 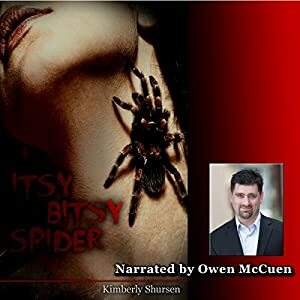 "Itsy Bitsy Spider" is a could-be-ripped-from-the-headlines tale that provides a chilling and stirring reminder of the real-life secrets that thousands in power work hard to hide from those closest to them. A fast paced, action driven plot that keeps the reader engaged and entertained right to the end. I enjoyed this book as I like suspense and the author certainly delivers on that score. The character development, however, suffers somewhat because the story is so intensely action driven. The relationship between Claire and Matt is instantaneous and also simultaneous with her attempt to escape from Mayor McCallin, her stepfather, and expose him for what he is. Everything happens just a little too quickly. Superbly narrated by Owen McCuen, he somehow manages to make the novel sound better than how it actually reads in print and in my head. He is adept at using well placed pauses, quickening of the pace in other places and adopting various tones of voice for the different characters. I read some of the ebook along with the audio and found the audio version to be a much better way to experience this novel. Highly recommended.